Ainsdale Premier Day Nursery was opened in 2001. The two sites represent a close knit team, who constantly strive to provide the very best childcare. 0-1 & 1-2. Our baby rooms provides a warm, safe, relaxing and homely atmosphere where the babies are cared for and nurtured by experienced nursery nurses. We will ensure that a close relationship is developed between staff, parents and baby, correct communication enables each baby to develop with the best attention and stimulation at all times in the fully equipped baby rooms. Age 2-3. Many children who may be unsure of life or are shy away the home are made to feel welcome and are soon having fun with the Premier Nursery team. Each child is discreetly encouraged to gain confidence whilst learning to mix, share and play with children of similar ages. The children are given the choice to embark on a range of activities and equipment both structured lead and free play, which is felt to be equally important.Our aim is for each child to enjoy learning and only when ready, experiment with pre-reading and writing skills along with colours, shapes and counting. Communication is constantly developed at all stages in this area. Age 3-5. All children at Premier Nursery are encouraged without pressure to develop their individual skills. We provide a variety of educational facilities, introducing writing skills, basic number and counting skills, basic reading flash cards and science activities.All children at Premier Nursery are encouraged without pressure to develop their individual skills. We provide a variety of educational facilities, introducing writing skills, basic number and counting skills, basic reading flash cards and science activities. At this stage of a child's development they are like little sponges when it comes to learning and their enthusiasm for life is often great! We embrace this time and make learning lots of fun! 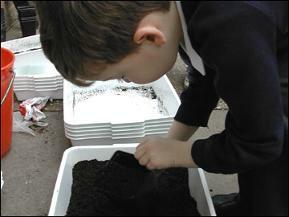 At Ainsdale Nursery we have the facilities for children to grow their own flowers and vegetables. By encouraging children to garden, we are creating the gardeners of the future, hopefully with a life long interest in plants. By starting with small and easy projects, such as growing sunflowers, children are encouraged to try more complicated things like planting a small flower garden or growing vegetables. Getting dirty is part of the fun of growing up. It isn’t really that important if your children are covered in mud occasionally and it may even give them a sense of accomplishment, ‘Look at me, I’m covered in mud, I’ve been really busy’. 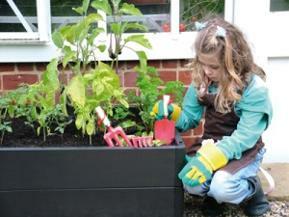 We sow big impact, fast growing vegetation that keep the child’s interest and encourage them to care for the plants. This year’s successes include Sunflowers; Cucumbers; Lettuces; Courgettes and Tomatoes. We give them responsibility, like digging out a giant weed or harvesting some fruit or vegetables. This makes your child feel important and gives them a boost to know that they’ve contributed to the day’s work. Premier Nursery is dedicated to teaching children on how to care for their environment and we encourage the recycling of all household waste.